What should a driver do if their vehicle gets into a front-wheel sideways skid? Correct Answer: Release the accelerator. What is the recommended minimum stopping distance for a car travelling at 100 km/h on a dry road? 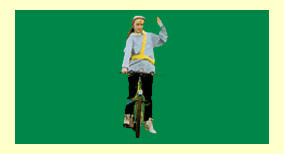 Correct Answer: The cyclist intends to go straight on. Correct Answer: That engine braking power is reduced. What should a driver consider doing when parking a vehicle on a two-way street and facing uphill? Correct Answer: Turning the steering wheel to the right. What is the minimum safe distance to leave between vehicles travelling at 100 km/h on a dry road? 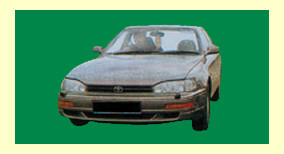 Correct Answer: The driver intends to move straight ahead. When driving on a one-way street and wishing to turn right, what should a driver do? 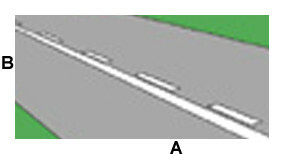 Correct Answer: Drive close to the right-hand side of the road. Correct Answer: The driver intends to turn left. What does this Garda signal mean? 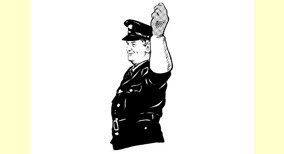 Correct Answer: The Garda is beckoning on traffic approaching from either side. Correct Answer: Major road ahead. What should a driver do to secure the towing vehicle before unhitching a trailer? Correct Answer: Apply the handbrake. switch off the ignition and engage a low gear. How should a driver in a vehicle without anti-lock brakes (ABS) deal with a front-wheel straight-line skid? Correct Answer: Press and release the footbrake at rapid intervals. When a driver intends to make a left-hand turn on a busy city street junction and there are pedestrians and cyclists around, what should a driver do? Correct Answer: Allow comfort space for any pedestrian on the left. While driving, what does a continuous vibration in the steering indicate? Correct Answer: The wheel balance is uneven. 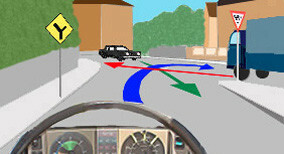 When intending to turn right as shown, what should the car driver do? Correct Answer: Proceed before the truck. What is the recommended minimum stopping distance for a car travelling at 100 km/h on a wet road? At a level crossing with unattended gates, what should a driver do? Correct Answer: Open both gates before proceeding to cross. What is the maximum number of passengers that may be carried in a vehicle driven by the holder of a category B driving licence? What effect does automatic transmission have on engine braking power? Correct Answer: It reduces it. What traffic may use a contra-flow bus lane? Correct Answer: Buses on a scheduled service. What is the maximum gross weight of a vehicle that may be driven by the holder of a category B driving licence? Correct Answer: Switch on hazard warning lights. What does these signs together mean? Correct Answer: Only buses, cyclists and taxis are allowed to use the lane during the hours indicated. When should tyre pressure be checked? Correct Answer: When the tyres are cold. What should a driver do if their vehicle gets into a rear-wheel sideways skid? 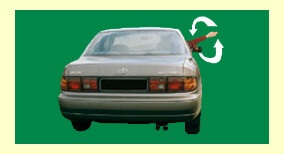 Correct Answer: Turn the steering wheel in the same direction as the rear wheels are heading. What distance before a zebra crossing is parking prohibited? When is a red flag a sufficient marker for a rear load overhang that exceeds one metre? Correct Answer: Only during the day. When attaching a trailer to their vehicle, what should a driver check? Correct Answer: That the load is evenly spread. How should a driver use the brakes if the vehicle is fitted with anti-lock brakes (ABS)? Correct Answer: Press the brake pedal firmly and hold. What should a driver do when involved in an incident where nobody is injured but the vehicles are causing a danger or obstruction on the road? Correct Answer: Mark the position of the vehicles and move them off the road. Where should a vehicle be positioned before turning right? Correct Answer: Just left of the centre of the road. What traffic may drive along on a cycle lane accompanied by a broken white line? Correct Answer: Cyclists and users of motorised wheelchairs. What should a driver do if they wish to turn right at traffic lights while the green light is showing and there is oncoming traffic approaching? Correct Answer: Go forward towards the centre of the junction and wait for a suitable gap to appear in the oncoming traffic before making the turn. Which of the following affects the braking distance of a vehicle? Correct Answer: The speed and weight of the vehicle. If driving from A to B, what do these road markings mean? 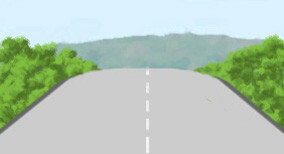 Correct Answer: A driver may not cross the lines to overtake. What effect could a rear-tyre blow-out have on a vehicle? Correct Answer: It could cause the vehicle to sway from side to side. A driver wishes to go straight ahead at a cross junction of equal importance - what should the driver do? 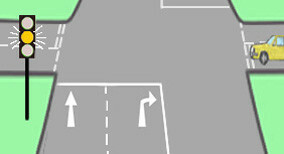 Correct Answer: Give way to traffic approaching from the right. What can a driver do to maximise fuel efficiency while driving? Correct Answer: Avoid carrying unnecessary weight. What is the maximum permissible speed for cars or motorcycles on single carriageway national roads? What effect could hitting or mounting the kerb have on a vehicle’s tyres? Correct Answer: It could damage the sidewalls. What effect would coasting have on a vehicle’s tyres? The driver of a tractor pulling a wide load that blocks their view to the rear wishes to turn right. What should they do? Correct Answer: Have another person advise of following traffic while the driver checks for oncoming traffic. What should you do when approaching traffic lights that change from green to amber? Correct Answer: Stop, unless it is not safe. What stopping distance should a driver allow when they suspect that the road might be icy? Correct Answer: Up to ten times the normal distance. When can the holder of a Category W Learner Permit carry a passenger? Correct Answer: Only when the passenger also holds a Category W driving licence and the vehicle is designed to take a passenger. Correct Answer: Wait and allow the oncoming vehicle to pass. What danger should a driver allow for over the brow of this hill? Correct Answer: There may be hedge-cutting taking place. What is the maximum permissible speed of a car towing a caravan on national roads?